Figure 6.14. 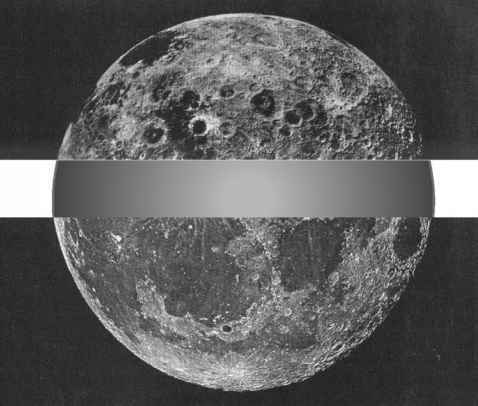 The far side of the Moon from Soviet Luna 3 spacecraft (top) compared with the near side (bottom) (From Discovery Magazine [Berman, 2003]). 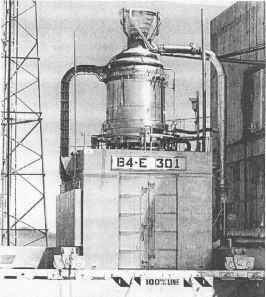 Moon underwent intense melting and differentiation in which incompatible elements were concentrated in the molten part of an increasingly solid, crystallized system. The highest levels of thorium are in the upper left-hand part of the left image in Figure 6.15 (see the color section). The highest level of thorium, a potential fission fuel, occurs in the Oceanus Procellarum, but the reason, again, is not clear. The Lunar Prospector also discovered evidence of water ice at the Moon's north and south poles. The Moon's highlands are dominated by rocks primarily composed of the mineral feldspar. Feldspar is rich in calcium and aluminum. Clementine and the Lunar Prospector came as close as 7 km (4.3 st. mi) altitude and were able to precisely measure the variations in the Moon's gravity. The result was concentrations of mass ("mascons") higher than the average predicted by gravitational measurements in some of the youngest impact basins. So, there are wide variations of the Moon's physical and geological characteristics, and there is hardly any symmetry between the near and the far side of the Moon. A great deal of research is clearly necessary to discover how the Moon was formed, what its structure is, and why. Understanding how the Moon was formed may provide insight as to how the inner planets of our Solar System were formed and some of the history of the Earth's development. Because of this diversity in the Moon's geology there are many opportunities to produce engineering materials and possibly propellants in situ, as the resources on the Moon are developed, creating an independent operational base that supports exploration of our Solar System. The Moon has been also proposed as an astronomical observation site. The Hubble space telescope is a tremendous astronomical asset in understanding the development of the universe and in progressing towards resolution of the many uncertainties concerning star formation, quasars, visible and dark matter, and the early time in the universe after the spatial matter became transparent. However Hubble is a high-maintenance item. Not because of its design or manufacture, but because of the way it must be maintained in Earth orbit. If the US Shuttle is not available to transport both crew and materials to Hubble there is no crewed system that will permit Hubble to be maintained or repaired. If Hubble or its equivalent were located on the surface of the Moon, then accessibility to resupply from Earth and availability of a human repair crew would not require any flight to an orbital location and work in zero-gravity. If there is something that does not fit or is broken the mission to the Hubble orbit is aborted, because there are no spares or repair facilities available nearby. On the surface of the Moon instead, all of the necessary facilities could be available for spare parts, parts repair, or part manufacture. The location would have to be located on the Moon for maximum visibility of the space of interest. A lunar surface telescope could supplemement Hubble and replace it when Hubble is no longer maintained in orbit.